I was getting tired of eating fresh papaya salad so I cooked the salad for a change! I have done this in the past and it turned out pretty tasty. This time I stir fried it with potato noodles, banana blossom, seasoned ground pork and oregano and topped with freshly roasted peanuts and a drizzle of Vietnamese dipping sauce--the final result was tasty! 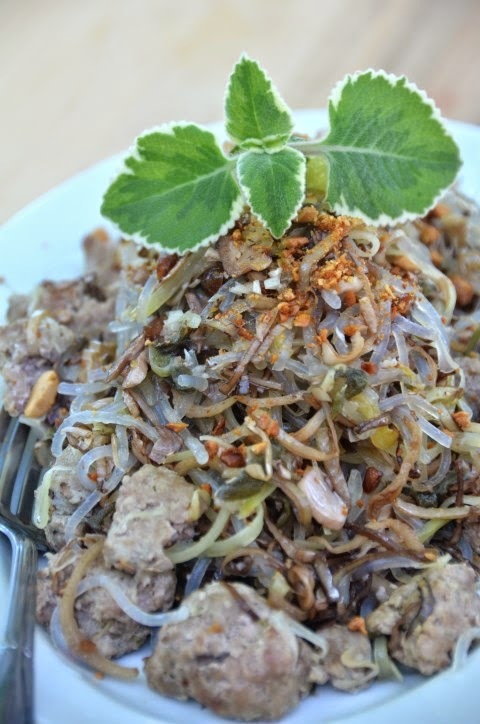 The papaya and banana blossom are mild in taste so it is easy to add and incorporate into other more flavorful ingredients (such as the seasoned meatballs). 1) Heat a non-stick pot or pan over medium high heat. 2) Once the pot or pan is heated, add oil. 3) Once the oil is hot add garlic and onion or shallots. Saute for about 1-2 minutes or until the onion or shallots is translucent. 4) Add meat and cook until everything is just cooked. Remove meat and reserve in a dish or bowl. May remove some of the excess oil. 5) Add papaya and banana blossom into the same pot or pan. Cook about 5-7 minutes or until the vegetables are somewhat wilted. 6) Add noodles, marjoram and the cooked meat. Stir occasionally for another 3-4 minutes or until everything is blended and heated through. 7) Drizzle in fish sauce according to your taste. Turn off heat, stir and let everything cook for another minute. 8) Remove from heat and add peanuts and dipping sauce or lime juice if interested. *May substitute fish sauce with salt. *I used 6 seasoned pork meatballs and broke each one into 4-5 pieces. *May substitute peanuts with another type of nuts, seeds or omit them. *If the pot or pan gets to hot just lower the heat slightly. I used an electric portable stove top that does not get too hot. *Potato noodles are found in Asian grocers in dry bundles in a package. It is the same noodles that the Koreans make jap jae. Cook the noodles following the package instructions. The beauty about this noodle is that it generally does not break apart easily during cooking. Mix all ingredients gently together until well blended. *May substitute ground pork for other meat such turkey, chicken or lamb. May even substitute with half chicken and half shrimp. *Depending on the size of preference for your meatballs, divide the meat out so you can have equal size balls. I made six balls with a pound of meat. I made this tropical seasoning blend a few times and really liked how it turned out. It's just a few basic ingredients that you can add to other ingredients easily. I made a small batch and kept it in a tightly sealed container in the refrigerator and used it over 5 days. I called it tropical seasoning since these ingredients grow year round in the tropics. I use this blend on both meat and seafood. 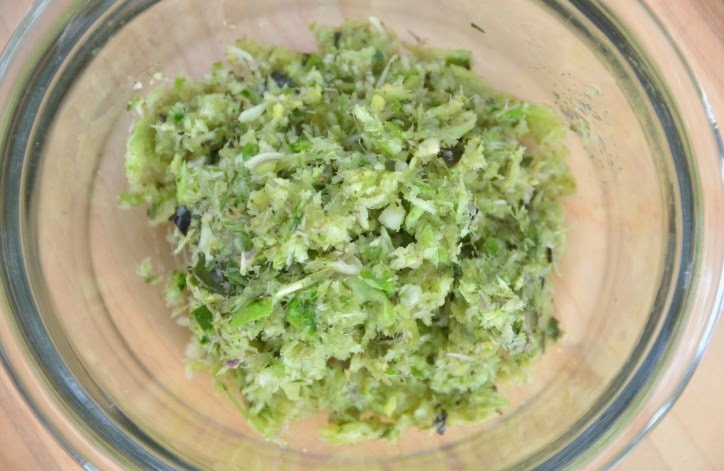 If you do not have any kaffir lime leaves then substitute with half a lime rind, grated. Grind everything in a coffee grinder. *Having an extra coffee grinder in your kitchen mainly used for grinding up herbs and spices is a great tool to have. 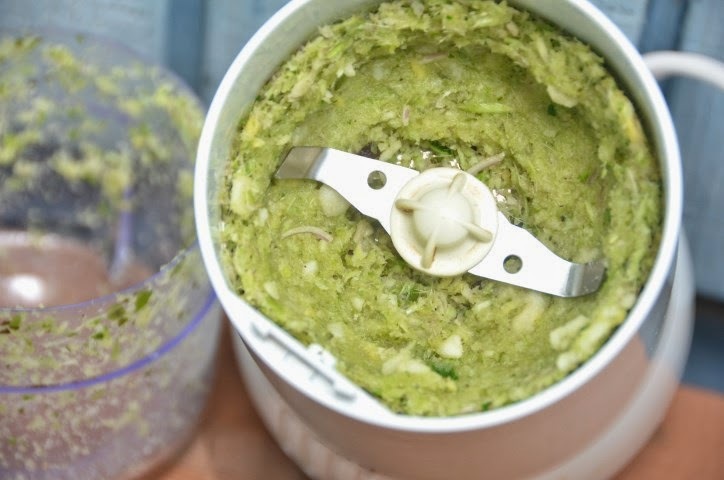 *If you do not have a grinder, cut everything as thin as possible and chop finely or use a mortar and pestle and mash everything all together. 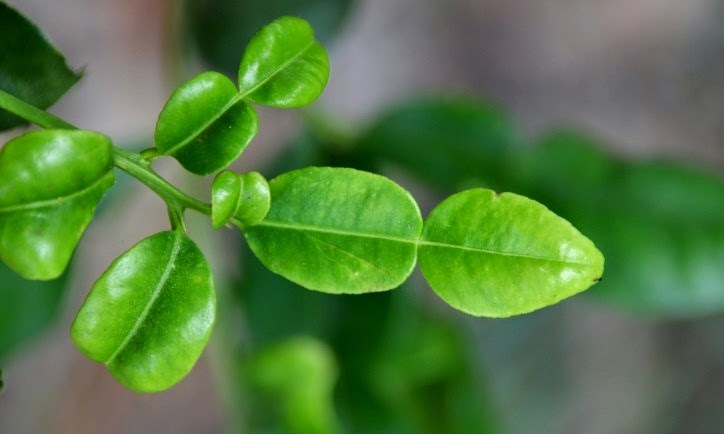 *The young kaffir lime leaves are located at the tip. 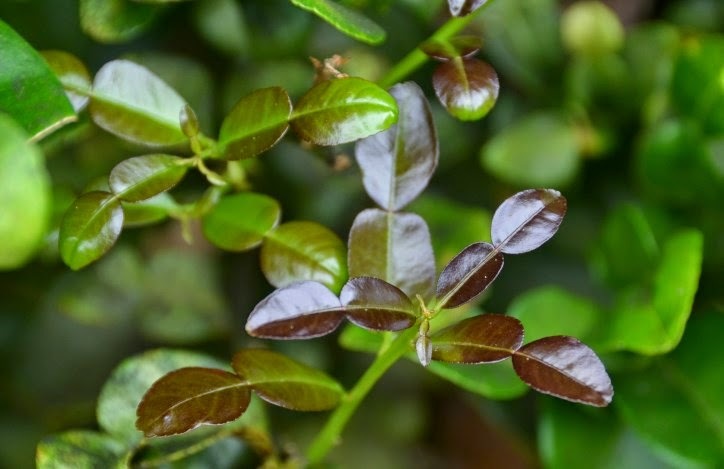 I prefer to use young leaves since they are a lot softer than older leaves. You may use the older leaves if these are what you have available especially if you buy yours from a store. If you are picking off from a bush or tree you may want to snip it with scissors since they do have thorns. The worst thing that I can think of is getting wounded when you are hungry!